Yoshino valley is famous for its three thousand or maybe more cherry trees, in the three lower, middle and upper levels of the valley.
. The main deity Zao Gongen　蔵王権現 . To the west of Kimpusenji there is a flight of several hundred steps that leads downward into a small secluded valley. 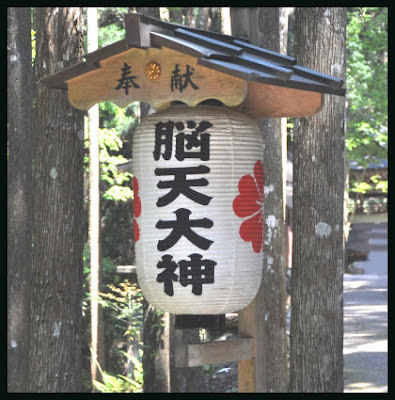 There, at a small shrine called Noten-o-kami, one can drink from the small spring, said to promote health, that emerges from a carved serpent's mouth. Pilgrims come to offer eggs to the shrineｹs deity. 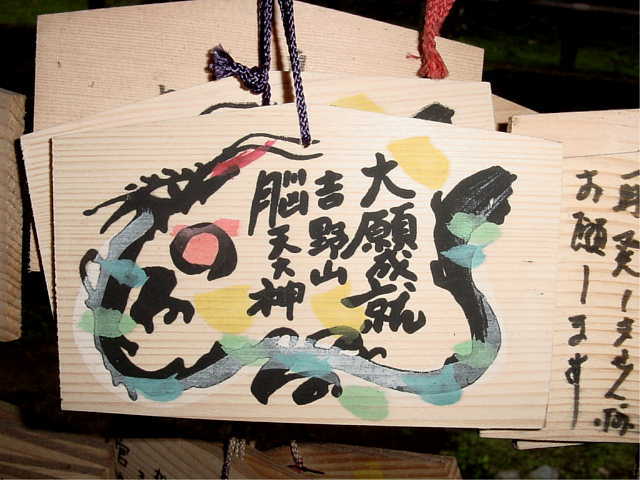 Inside the shrine, the custom is to do clockwise prayer circuits, dropping wooden sticks one by one into a large bowl. One wall of the shrine's exterior is colorfully decorated with origami strips.
. Yoshinoyama - 吉野山 Nara . Walking down a long stairway there is the compound for this deity. Here is a place for water ablutions and goma fire rituals of the yamabushi ascets of Yoshino. brain heaven big deity 脳天大神 "Brain from Heaven"
so people come here for all things refering to a good brain, like passing an examination or get good employment. It also helps to cure diseases of the head of any kind. also known as "first child" Hatsuko 初子. 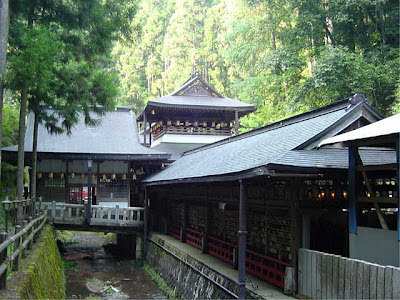 This temple was also a place where women could practise like the yamabushi mountain ascets. 女人行場. Once Prince Choogaku Hosshinno 澄覚法親王 (1219 - 1289) was climbing down the stone stairs to Ryuo-In when he saw a beautiful woman under the waterfall. She told him to make a place for ladies to worship in the mountains here. The dragon waterfall for ablutions 金龍王の滝 has never dried up since. Other versions of the legend say he helped a huge serpent, which had fallen off the cliff and hurt its head, splitting it in two, so he build a small shrine for it to be worshipped. That is why the deity later took the name "Brain from Heaven" and made the vow to help all with pain and problems of the head. People offer eggs at the temple to imply the head of the serpent that has split. Sometimes a snake which lives in the temple compound comes out and eats these eggs. To the right of the statue of Noten is Fudo Myo-O and the Eight Dragon Kings, to the left is the statue of En no Gyoja 役行者. This represents a mixture of Buddhism and Shintoism 神仏混交. Noten Okami accepts all kinds of worship. Noten Okami holds a precious ball 霊宝玉 in the left hand amd has the features of a young man. But his statue is kept secret at this temple and never shown. He is said to be the "son" of Zao Gongen" and thus has a family relation with the main temple, the Zaodo Hall. Prince Chogaku also had the inspiration that the Buddhist deities and the Shinto deities of the mountain region were in fact all one and should be worshipped as one and the same, Zao Gongen. 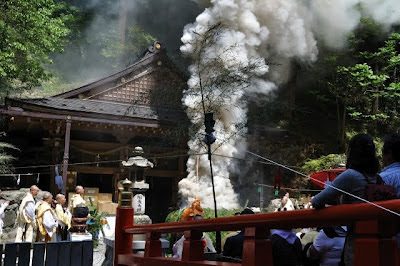 During the separation of Buddhism and Shintoism after the Meiji restoration this region suffered a lot from destruction of temples, shrines and statues, since it did not belong to either of these religions. Dragon supporting the precious ball 霊宝玉.
. Ryuu-oo 竜王 Ryu-O - The Dragon King . a manifestation of the Snake.